Home Biblical Christian Articles Winds of Doctrine Yahushua’s Death: Abolishing the Law? Satan is called the “Father of lies.” Yahushua Himself stated that the devil “was a murderer from the beginning, and abode not in the truth, because there is no truth in him. . . . he is a liar, and the father of it.” (John 8:44, KJV) Deception, by its very nature, is weak. It will never have the strength Truth possesses. A lie standing alone will always fail to deceive. Satan knows this, so he twists his lies with truth. The closer to truth he can make his lie, the more deceptive it will be. Satan knows that the Law is a transcript of Yahuwah’s holy character. Therefore, it is as unchanging as the Law Giver Himself. Satan wants people to break Yahuwah’s holy Law. In order to do that, he must deceive them into thinking that Yahuwah’s law has been changed or that it is no longer necessary to keep the law. No one would believe such a ridiculous lie were it not entwined together with truth. So Satan quotes Scripture itself to “prove” his lie. Ephesians 2:15 is a text that is often taken out of context as proof that the divine Law is no longer binding. In fact, it is not even a complete sentence. It is only two phrases taken out of context and twisted in order to support Satan’s lie. Yahushua perfectly kept the divine Law. In keeping the divine Law in every particular, Yahushua set an example that all are to follow. 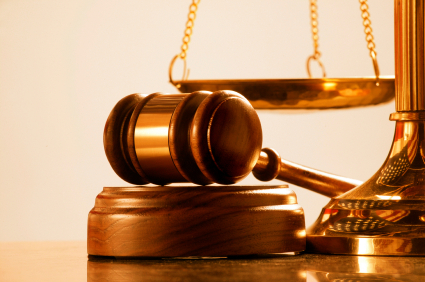 Scripture always teaches that the divine law is perpetual. It is always to be kept, both in Heaven and on earth, throughout the ceaseless cycles of eternity. Any Bible text that is used to “prove” the law was “nailed to the cross” is twisting Scripture to support Satan’s lie that the divine Law need not be kept. The correct understanding of Eph. 2:15 becomes clear when the entire passage is read in context. In time past ye walked according to the course of this world, according to the prince of the power of the air, the spirit that now worketh in the children of disobedience . . . But Yahuwah who is rich in mercy, for his great love wherewith He loved us, Even when we were dead in sins, hath quickened us together with Yahushua, (by grace ye are saved;) And hath raised us up together, and made us sit together in heavenly places in Yahushua: . . .
Wherefore remember, that ye being in time past Gentiles in the flesh, who are called Uncircumcision by that which is called the Circumcision in the flesh made by hands; That at that time ye were without Yahushua, being aliens from the commonwealth of Israel, and strangers from the covenants of promise, having no hope, and without Yahuwah in the world: But now in Yahushua ye who sometimes were far off are made nigh by the blood of Yahushua. . . .
Paul is writing to Gentiles, reminding them that, before they became Believers, they “walked according to the course of this world” (verse 2). The course of this world is one of man-made traditions leading to prejudice and exclusivity. The Israelites were some of the most prejudiced people in the world. Yahuwah planned for Israel to be “the light of the world.” (Matthew 5:14, KJV) Instead, the Israelites became a very closed society, convinced of their own superiority, shunning outsiders. Paul refers to the prejudiced divisions between different peoples when he states: “In time past ye walked according to the course of this world, according to the prince of the power of the air.” (Ephesians 2:2) Satan’s practice has always been to promote hatred, suspicion, prejudice and division between peoples. That is the “course of this world.” Yahushua came to bring unity through divine Love. He was as comfortable and accepting in the homes of the very poor, as He was in the palaces of the rich. Yahuwah “is no respecter of persons: But in every nation he that feareth Him, and worketh righteousness, is accepted with Him.” (Acts 10:34, 35) This was a concept that was difficult even for the Apostles at first to grasp. It took a heaven-sent dream before Peter would step foot into a Gentile’s home, and even later he succumbed to pressure from other Israelites who were prejudiced. Seeing what was happening, Paul quickly put a stop to such divisive behavior. The word “ordinances” to which Paul referred when he spoke of “the law of commandments contained in ordinances” (Ephesians 2:15) comes from the word “dogma” (#1378). It is the same “traditions of the elders” to which Yahushua referred when He pointedly asked, “Why do you also transgress the commandment of Yah because of your tradition?” (See Matthew 15:3.) The “law” and “commandments” to which Paul was referring in Ephesians 2:15 was not the divine Law which Paul admitted was holy, just and good. Paul was referring to man-made traditions, the burdensome restrictions imposed by religious leaders who were teaching people they must work their way to Heaven by obeying their made up rules. These human imposed laws and restrictions were largely responsible for the feelings of prejudice, suspicion, hatred and separation between the Israelites and Gentiles. Such man-made rules were responsible for the high “middle wall of partition” between the Israelites and the Gentiles. Paul’s point in Ephesians 2 is that Yahushua came to redeem all peoples everywhere. 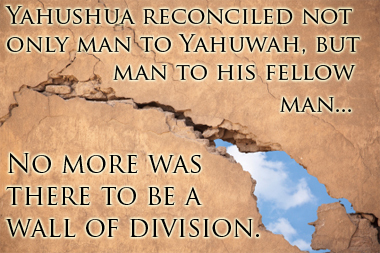 Yahushua reconciled not only man to Yahuwah, but man to his fellow man. No more was there to be a wall of division between Israelite and Gentile, male and female, saved or unsaved. Yahushua was the perfect embodiment of the divine Law. As such, He broke down the laws of human tradition and prejudice that were imposed by small minded people. The ultimate fulfillment of the Law is Love. In Yahushua, all are united together in Love. Ephesians 2 rejoices in the new-found unity and brotherly love brought by Yahushua and His keeping of the never-ending, holy, just and good divine Law. LIFE: Yahuwah - John 14:6; His law - Matthew 19:17 . MERCIFUL: Yahuwah - Exodus 34:5; His law - Psalm 119:58. "Think not that I [Yahushua] am come to destroy the law, or the prophets: I am not come to destroy, but to fulfil." and may enter in through the gates into the city [New Jerusalem]."